My daughter and son-in-law’s house desperately needed new windows. All the glazing was falling out, sills were rotting, windows would not operate smoothly , not to mention drafty, in spite of storm windows. After quotes ranging from $12,000 to over $20,000 we decided to tackle it ourselves. After careful measuring, they ordered 19 Anderson MH70 Series vinyl double-sash windows from HD. These were not the cheapest, but were the next step up. This job involved total tear-outs of each window. All the sills and brick molding had to be replaced. The actual window sizes caused problems for us. For example, they had several that were ordered as 36″ x 53.75″. However, the actual heights of the windows received were 54″ – one quarter inch taller than the measurement we specified. The width of 36″ was exactly what we ordered. 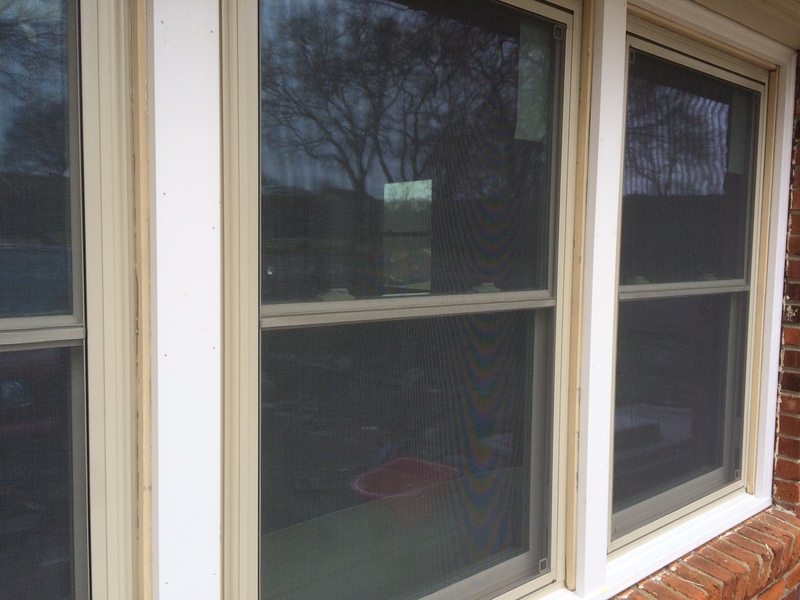 The sticker on each window showed 53.75″ but as I said, the actual measurement was 54″. Why is everything never easy!!! This was a difficult job, made more challenging by installing in the winter. It took several weeks to finish because of working around rain, cold, and snow. The finished picture below is before painting the surrounding molding and sills.